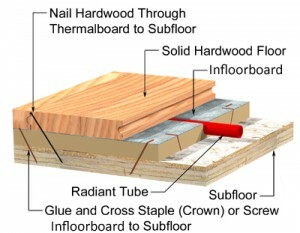 Infloorboard is a radiant flooring system that is designed to be installed on top of a subfloor application. It’s constructed of a dense composite board covered with aluminum that spreads the heat evenly and quickly. Infloorboard heats rapidly and is easy to control, providing quicker response times than standard concrete or gypcrete systems. It contains enough thermal mass to be effective, but not so much that it is difficult to control. Infloorboard is only 5/8″ thick, allowing installation on an existing floor with minimal changes to existing floor heights. It works well with almost any floor coverings, including hardwood, tile, and carpet. Infloorboard saves on work, materials, time, and money when compared with other thermal mass options. 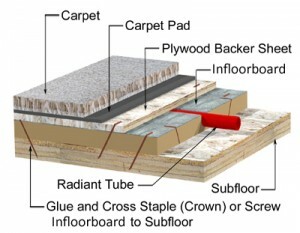 No other product combines the performance, ease of installation, and cost-effectiveness of Infloorboard.